Dimensional printing, texture printing in phoenix az, chicago il, tuscon az. 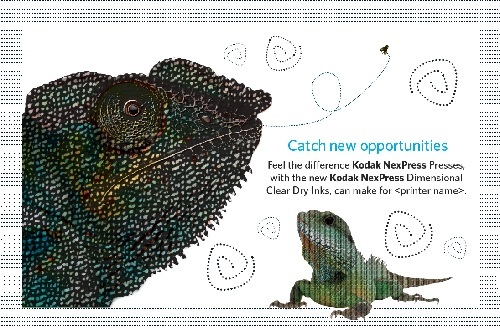 Amplify the senses with high impact printing that you can see and feel with the NexPress printer. Get your attention-grabbing graphics noticed with vivid colors that make a statement. Now add texture, dimensional printing, that creates the experience. Your prospects will get the experience that only you can deliver. Use the NexPress printer on more than postcards and brochures. How about watermarks, MICR print jobs or even a protective coating. The versatile NexPress knows how to get results.